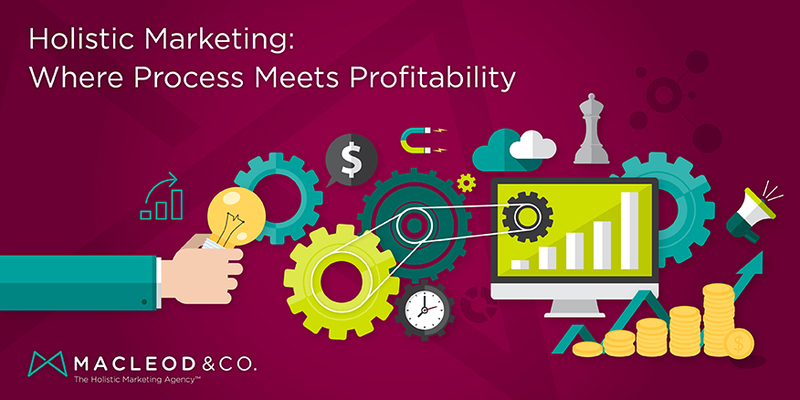 Holistic Marketing: Process Meets Profitability | Macleod & Co.
To us, marketing isn’t just the act of promoting a company, product or service; (holistic) marketing encompasses the entire process of bringing something from its point of inception to its point of maximum ongoing profitability. That means it starts at the point when the company is formed, the raw materials are turned into product, the candidate is nominated, the vision is born and the mission becomes real — not later down the road. Profitability, on the other hand, is defined by you. And it isn’t always about making money; it can just as easily be about changing public perception, winning that election or curing cancer (okay, maybe not just as easily…). Based on that change in scope, where does Holistic Marketing “live” in an organization? To us, it brings planning and execution together, so it lives at the intersection of marketing and organizational effectiveness. After all, you can develop the greatest marketing plan in the world, but if it makes promises that can’t be delivered — or your people and structure aren’t equipped to make it happen — then what good is it? As Peter Drucker says, “Culture eats strategy for breakfast.” In our experience, culture is always the point that makes or breaks an organization. If your people are not pulling in the same direction — and the same direction as the leadership — then you’re not going to maximize your profit. Brand is the promise you make to your customer, and product is the fulfillment of that promise. Is the promise appropriate and achievable? Does it resonate with your target market? Does your product (and culture) support that promise? What revisions are needed to align everything for maximum profit? Human Systems is where the rubber meets the road. How do people work together? Have systems evolved organically that are counter to your profitability goals? Counter to the culture you strive for? How is the product you’re putting out being used? By asking and answering questions through a human lens, we generate invaluable intelligence that allows us to strategize effectively and efficiently, saving you time and money. The ultimate deliverable: a marketing plan coupled with strategic execution that supports your goals, is supportive of your organization and, most importantly, is supported by your organization. See how we’ve helped other companies and view our Holistic Marketing Portfolio.